Here in Australia, we don't celebrate Halloween very much, but try telling that to my daughter, who has been planning her costume since last Halloween. Of course I like to celebrate every occasion by reading - but maybe I'll make my books just a wee bit spookier than usual. Here's a little list of three scarily wonderful books that readers who don't want to tip over into the horror genre can still enjoy when everything else is too light and upbeat. First off the bat is Carlos Ruiz Zafón. Take your pick - they're all good and all spooky, but I'm going to recommend The Prince of Mist just because it's his YA book, quick and easy to read, and spine tingling, even at the end. Then there's Neil Gaiman. 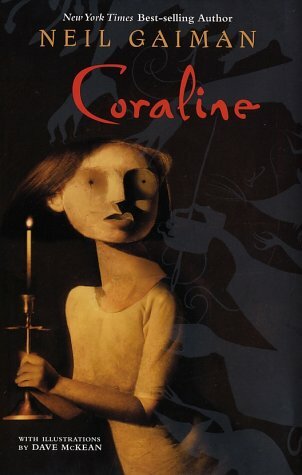 You could go with The Graveyard Book, but actually Coraline is the more disturbing because more like a universal nightmare. Those button eyes and mother-not-mother still haunt me when I think about it. Finally, from the archives, there's Robert Louis Stevenson’s The Strange Case of Dr Jekyll and Mr Hyde. I'm going through a little Stevenson revival at the moment, and as with The Prince of Mist and Coraline, what works so well in Dr Jekyll and Mr Hyde is the universal chord that the book touches. We all have a touch of Hyde in us (though hopefully not to the same extent) - that evil twin (the not-mother, the spurned clown) who takes us near the edge. We can almost understand, empathise with, and even see ourselves slipping into that bad guy role. Bwahahaha. Happy Halloween. pockets and shoes stuffed full of sand, and children's voices mingling with hungry gulls in the background. 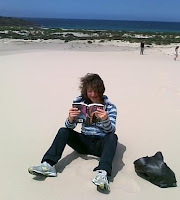 Here I am reading John Flanagan's last Ranger's Apprentice book number 11: The Lost Stories. I've got an interview with John next week and although I wouldn't normally be drawn to these kinds of 'boys own' adventures, my twelve year old loves them and I agreed to read the books and interview John on his behalf. I have to say that I've been enjoying the books very much, even to the point of ignoring my kids shouts to come and roll down the dunes with them (um, tempting as that was), since I had to see what Rangers Halt and Will did next. I did eventually put the book away and made it up and down the giant dunes multiple times, Will and Halt accompanying me all the while. I like encorporating the scene of my reading into the whole fictive experience. Sitting in a beautiful remote landscape (and this one was truly beautiful) while reading about smashbuckling daring deeds is part of the fun. The wind in my hair mirroed the wind in my characters' hair as they rode their talking horses, and fought battle after battle against pirates, roamers, "moondarkers" and highway robbers, leaving their world a safer place. Where's the wildest place you've ever read? The most inhospitable or exquisite conditions? Do you require a 'fine and private place' to read or can you drop everything anywhere and dip into that lovely fictive world? Online Writers Conference as a presenter, and every year it seems to get just a little bit bigger. The first year I presented, I ran a poetry workshop. A group from that session were so inspired, from each other as much as me - I encouraged them to critique one another and they really jumped into that, that they formed a poetry writing group called Poetic Muselings that continued to work together. Their anthology titled Lifelines has just been accepted for publication by Inkspotter Publishing. Am I proud? You betcha. This is about the best outcome a writer teacher could hope for, and is due in large part to that wonderful rarified air of a conference that transcends space, linking a group of individuals towards a shared goal. I've since run workshops on characterisation, workshops on writing a query (and several of the people on that course have gone on to have the books they've queried accepted by traditional publishing houses - yay!). This year I did a joint week long workshop with the wonderful Karen Cioffi on "Creating and Building Your Author/Writer Online Presence". It was a big, full-on course that went from website and content creation through to article marketing, SEO and keywords, podcasting, creating ebooks, online commerce, and information marketing. Kind of like a one stop online platform bootcamp. Any one of those topics could have run in a full week workshop, but our ambitious attendees got stuck in and worked hard, setting up or tweaking their websites, creating and submitting keyword rich, optimised articles, and even creating their own podcasts. I was so inspired by both Karen and our attendees, that I completely revamped my own website during the week, moving it to a new platform and giving it a fresh new look. There were many different workshops held, dealing with topics as diverse as shoestring marketing, writing suspense, working social media, developing a unique voice, obtaining contacts, writing flash fiction, fantasy, horror, self-publishing, creating worlds, espionage, and even creating monsters. If I had the time, I'd probably take every one of the courses. As it was, I was busy teaching my own! But one of the benefits of the Muse, is that all the workshops and documentation remain visible for several weeks afterwards, and you can bet I'll be trawling the boards to gather in as much of this collective store of knowledge as I can. If you didn't make it this year, there's always 2012. Though it may look like the writer isn't doing much, sitting for hours in front of a laptop, the brain is heavily engaged. The work is often emotionally demanding, taking us places that we're afraid of but need to go, and forcing us to look into the black heart of our deepest fears to uncover truth in our characters and situation. It takes great courage to walk the difficult path of the artist, and often the effort is physically exhausting. Fear is always tracking you, and the closer you are to reaching your writing goals, the more intense and insidious that fear can become. Fear is a great shapeshifter, looking like block, like the need to research, like being too busy to write. It can stop your story in its tracks just when you're about to make a breakthrough. My latest work in progress is particularly challenging, taking me to dark recesses of the past, exploring notions just beyond my intellectual capabilities, and forcing me to rethink what I know about fiction. Every writing session is hard. That's how I know I'm on the right path - because it it were easy, I wouldn't be pushing myself, growing, or moving my skills to a higher bar. So how does one cope with this fear in all of its incarnations? How do you push through it towards completion? It helps teach us to see writing as a practice, rather than an end point. We keep moving along the writing path, growing, changing, and pushing towards wisdom and expression. It's not possible to fail, no matter how hard it is, when you have this perception. Showing up for practice is all that's needed. 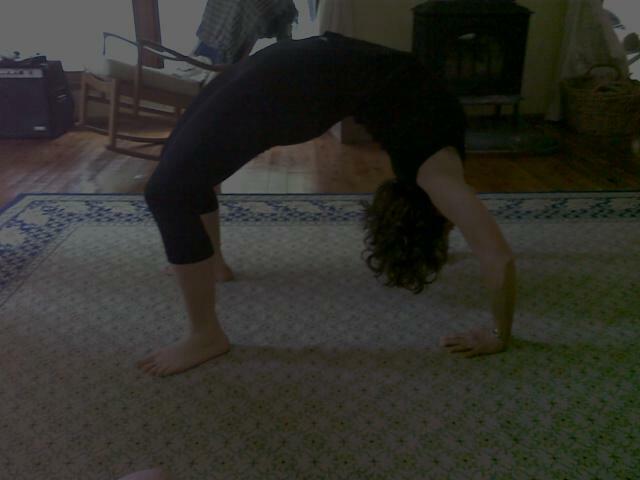 It teaches you to breathe. Ah, breath. How simple and yet how powerful. Breathing is the perfect antedote to fear. I first found out how powerful it was when I was in labour with my first child, screaming in pain. An angel of a midwife came to me and taught me to breath slowly, deeply, with my full body and I calmed down and got to work. I've turned to breath again and again in times of stress, strife, and fear, and it never fails to remind me of the transience of each moment and the need to work, calmly, through panic. It teaches patience. Sometimes the right words take time to come. You have to keep showing up, doing the exercises, stretching, breathing and working towards the vision. Yoga teaches me to see my writing as work that has to be done - a responsibility and positive impetus rather than a vanity (another manifestation of fear). So next time you're struggling with the dragons of fear -- call it what you will: block, self-doubt, other priorities, "no-time" -- try taking a 30 minute yoga break and see if that doesn't help. Breath through it. Even when it hurts. Then back to work. The world is waiting for you to change it.